One reason that ODS might contact instructors is to arrange for the conversion of textbooks and other class materials to alternative formats. Often, instructors are able to make their digital content accessible to students without any additional work (most content in Word, Excel, PowerPoint, PDF, etc. can be formatted to be accessible). The conversion center obtains student books in the format closest to digital that they can find. A digital file from the publisher is ideal, but sometimes they have to start with a printed book physically scan it, and then convert it using a multi-step process to the student’s desired format. The majority of the documents prepared by the Alternative Format Conversion Center are formatted to be read by a screen reader or other text-to-speech program. Faculty members are key partners in this conversion process because ODS wants streamline their conversion process as much as possible, converting content in the order of the syllabus/curriculum plan. 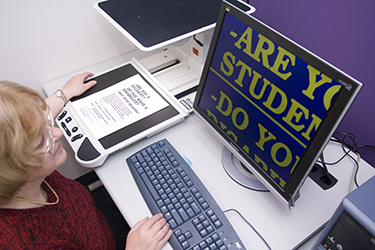 If you have a student who uses ODS alternative format conversion in your course, ODS staff may contact you for information on your textbooks, Pilot content, course reserves, handouts, and other materials. We need the vital information on your syllabus and reading/assignment schedule to stay up to date on student needs. If you make any alterations to the syllabus after the beginning of the semester, please inform the students and ODS immediately. The process of transcribing books begins when an eligible student submits a request for their books in alternative formats. When ODS receives a student request, our staff immediately begins the process of finding out as much as we can about the materials being used for the class. Since students usually need the converted books and materials before classes start, we start working as soon a request. First, ODS contacts the instructors, and requests a book list and syllabus for each course for which ODS has a student request. ODS also contacts the bookstore to see what the instructor has ordered; if there is no information at the bookstore or ODS is unable to get hold of the instructors, the staff contacts the instructor’s department office. Once the book information is gathered, our staff checks to see if this is a book we have processed during a previous semester. If we have not, the staff attempts to get the book from AccessText, an organization that works as an intermediary between schools and publishers (digital copy of the book because the process of physically scanning each book takes much more time and labor than converting a digital copy. Currently, it is primarily the larger publishers who work with AccessText, so if the book was published by a smaller publisher, we have to find other sources for the book. We start by checking the university library and OhioLink, and contacting the instructor, department, and student to see if we can borrow their book to scan. The technical process for converting textbooks to Braille, text, and audio formats can be time-consuming and sometimes is difficult. The more technical and/or specialized a book is, the more difficult it can be to convert. For example, novels take a fraction of the time that math or a foreign language require. The process of preparing the book depends on the format to which the book is being converted. Once ODS has a student’s book list, class schedule and syllabus, conversion work begins. If ODS does not have complete book information, then the book may not be converted in a timely manner for the student. There have been times when a student has turned in a course syllabus in a timely manner, but later we find the professors have changed a book or added a book. Unexpected circumstances like this can create a delay for the student, as well. How can I make my class materials more accessible? Provide your book list, syllabus, and course reserves list to the bookstore as soon as possible before a term, and to ODS upon request. Communicate with ODS and students regarding course requirements. Assistive technology (AT) is an umbrella term that includes any device, equipment, hardware, software, or service that provides or improves accessibility for people with disabilities. Assistive technology items may be used as purchased; they might also be built, modified, or customized to meet specific needs for individuals with disabilities. Assistive technology services may be used to accommodate a variety of disabilities. Our staff advises students on the most effective software, hardware, and other technology to enhance and supplement their studies and academic performance. To learn more about how different types of disabilities can be accommodated by technology, please visit the Accessible Technology Coalition website [http://atcoalition.org/]. Recommendations for hardware and software for accessibility, study, reading, dictation, etc. Priority access to the adapted computer lab in 034 Library Annex (maintained by CaTS), equipped with multiple adjustable computer stations, equipment for digital enlargements, scanners, specialty software, etc. Eligible students who register for this fee-based, elective program are assigned a transition coach to work with them, one-on-one, for up to 5 hours per week. The transition coaches are experienced undergraduate or graduate students who are available as a resource for students on the Autism Spectrum. Employees of ODS, coaches set their schedule to accommodate their students’ specific needs. Coaches work with students on transition competency areas to develop the structure and framework necessary to be successful in college. The coach’s focus can include assisting the student with learning self-advocacy skills, accessing campus resources and services, and problem-solving. Why might a student use these services? A list of clinical symptoms does not fully express the range of effects that ASD might have on a student’s performance in college. It is even more difficult to get to the root of those symptoms when they are emerging as behaviors and anxieties that sometimes need immediate mitigation, correction, or redirection. Not every student will manifest the same or every symptom; factors like family background and lifestyle, K-12 schooling experience, etc., will make significant contributions to the student’s acclimation into the university setting. By the time they arrive on campus, students with ASD may have integrated some maladaptive behaviors and thinking patterns that developed over time and in reaction to their environments and circumstances. Setting the student on successful transition plan is not a matter of prescribing a set of directive based solely on the student’s diagnosis (“student with ASD needs [BLANK]”). The eligibility assessment provides insight into adaptive behaviors, challenge areas, potential obstacles to success. This is an individual process in which we determine and prioritize the strategy to success. Throughout the coaching process, every participant is entering the program from a different direction, at their own experience level, and with an earnest desire to succeed in college. Assistance with search for internships, co-ops, volunteer sites, career employment, etc. Students with disabilities need to be informed about their legal rights and responsibilities as a person with a disability, both in college and the workforce. Self-advocacy skills and knowledge of the ADA law are the best first tools for any person with a disability to access all the resources necessary to academic and professional success. On-campus personal care assistant (PCA) services are available to eligible students with physical disabilities. The on-campus services are provided on campus by trained ODS student employees. Students who wish to employ personal care assistants from an agency or an independent provider are welcome to do so. PCA services are designed to accommodate students on an individual basis, assisting them with daily activities, such as personal hygiene, dressing, dining, and laundry. Each personal care plan may vary from student to student.